I had some thoughts about cool places to do a 2018 rally in Colorado if people are interested in doing another one here. I was mainly thinking about basing it out of Nathrop (just outside of Buena Vista) because Cottonwood pass should be 100% paved by then and would be a blast to ride. We could also include rides on Independence pass and Monarch pass. People could either stay hotels in Buena Vista, Nathrop or even Mt. Princeton Hot Springs and the rest of everyone could camp at Chalk Creek campground. Thoughts? Im only proposing this because I need my bike fixed again guys. Haha. I've stayed in Buena Vista at both Super 8 and Best Western, and I like that area. Heck, what area in Colorado can't be liked. Its all BEAUTIFUL. An evening ride up the old train track right-of-way thru the tunnels now dirt road 371 on the east side of the Arkansas River is pretty awesome too. Looks like Chalk Creek Campground might have some Cabins. Bigger than the 10x10 boxes Jerry and I rented at the Echo Canyon Rally (Canon City). Princeton: @ $200 a night that Princeton Hot Springs Resort is way out of my budget range, but would be nice place if somebody else was offering to pay for it. If that Cottonwood Pass roadwork project gets completed by Rally time that would be a hoot to run on that new pavement. Was reading that they said, why just 'fix it a little' when we can just 'Fix It' and make the entire road correct to a state minimum standard. I never rode the dirt road so I guess when they talk about fixing the 'S' curves it was in the dirt section on the western slope? 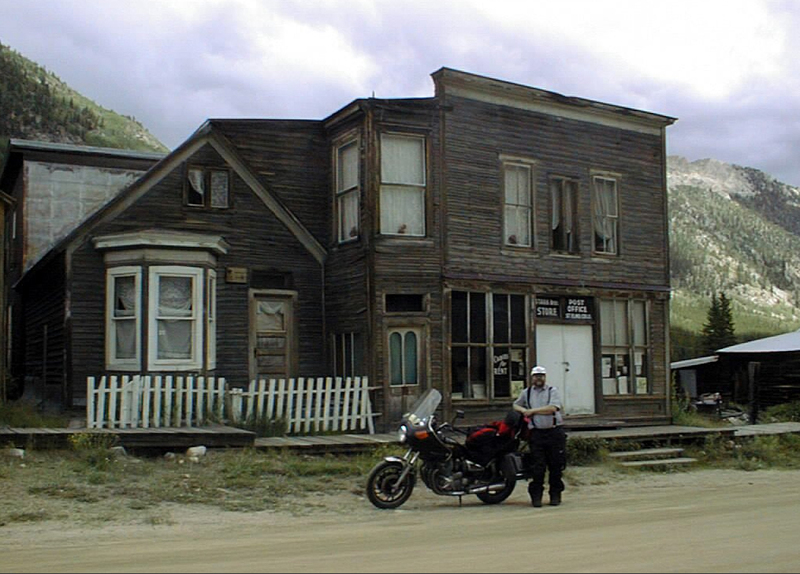 St. Elmo (semi-ghost town) is a favorite destination of mine in this area. I don't mind riding dirt and gravel but not if there has been any recent rain. Dirt routes are very weather dependent where paved roads are a better all-weather bet. I would be up for another ride in this area, have not been down there for a few years. The Mt. Princeton thing is out of my budget as well, just figured I'd throw out the option. That was so people could get that Wild Hogs hot springs scene taken off their bucket list, haha. From my understanding, they are paving the entire western slope of Cottonwood down into Taylor Park. The logical route for one day would be to do Cottonwood into Taylor Park then cruise down to Gunnison for lunch or something. From Gunnison head east on Monarch Pass and back through to Salida and ultimately back to camp. The next day could be a trip up through Independence Pass, however, there is no logical loop to my knowledge (that isn't SUPER long). I am very partial to Tarryall road as well. Loads of twisties and great scenery. St. Elmo would be just a hop skip and a jump from Chalk Creek Campground. I agree with you though, cool little place! I used to hike back into Grizzly reservoir when I was a kid. Cottonwood Pass shows up on GPS units as an alternative to I-70 if the later is blocked for any length of time which happens a couple times a year. Trucks that try it can't make it, get stuck, and have to come down the east side again. Not impossible - a few have made it - but conditions (weather and traffic) have to be perfect to do so. "Improvements to the pass are estimated to cost $27,115,000, but the proposed improvements qualify for funding under the Federal Lands Access Program, which supports work on public highways, roads, bridges, trails and transit systems located on, adjacent to, or providing access to federal lands, so the Federal Highway Administration will fund the remaining $25,623,675. Mark your calendars a year and a half out. County Road 209 will be closed from Taylor Reservoir to the top of Cottonwood Pass for the entire 2017 construction season, meaning May through September, and for as much of the 2018 dry season as necessary to complete the project." Last edited by Jerry; 10-18-2017 at 12:11 PM. Sounds like a pile of plans, I'm in. Well, we could leave that as a "maybe." The views up there are spectacular and I'd love for some of the out of state guys to see them. If that doesn't work we could do your route. Question, did you guys hit Cripple Creek two years ago? If so then we can skip that. Gonna try and think up some routes around Leadville. If we set base camp at Chalk Creek I can drive out there the day before the rally, snag a spot and bring a bunch of firewood and any other random things that might be useful. I'm only about an hour away from there (so is Skids). Any type loop ride from Leadville(10,000ft. elev. in town BTW) area would be either Battle Mountain down to I-70 or east and down to I-70.....definitely be a long, long riding day! Cottonwood Pass down to Crested Butte then Gunnison up over Monarch also a long riding day! Very familiar with ALL these roads and travel directions, and a lot of them, in order to make a riding loop without repeating same highway DOES make for a LONG riding day .....BTDT many a time . I like long rides! That's why I bought a cruiser! Leadville over Independence Pass into Aspen then north to I-70 east back to Leadville is a good day ride. (Route from Aspen to I-70 goes through several small towns including Glenwood Springs where it joins I-70.) Several points of interest along the way, including an old mining camp, and a side trip to Maroon Bells (have to park and take the bus in plus it is a fee area) would not be out of the question. Parts of the drop into Aspen from Independence are single-lane but the road is paved the entire distance. Two routes out of (or into) Leadville from I-70, the more scenic one is getting off at Minturn (west of Vail) and go down the valley that way. Other route leaves I-70 near Frisco and goes past a huge open-pit mine just before Leadville. Both routes join up on the north end of town. Leadville has a few points of interest as well; Tabor Opera House and National Mining Museum are both open for tours during the summer. If a rally is based out of Nathrop you could go north to Leadville as a day / side trip as well or just ride to the top of Independence Pass. There is a rest area near the top of the pass so you do not have to make the whole loop without a comfort stop. Anywhere you go there are some good rides but doing entire loops can get a bit long. Keep in mind that many would want to stop and take some photos along the way and these stops add to the over-all time it takes to get there and back. It is also high-country riding and speeds are going to be fairly slow for long stretches so you will not make the time one can make in other venues. I’ll second the Tarryall road, newer pavement and twisties. Buena Vista to Hartsel, east on 24 to the Tarryall road, up to Jefferson, west backover to FairPlay then Hwy 285 back to Bueny. Or reverse. Good 135-ish mile ride. Fairplay is the current “home” to the “Hoffman crew” in the Discovery Channel show “Gold Rush”. Maybe catch a sneak peek of them at a watering hole for lunch if they are still mining there next summer. That is one nice day! Then cottonwood pass loop to Gunnison and over Monarch, back up to Buena Vista for a good second day. Will get some good twisty and open road riding one day, and high mountain passes and even more awesome scenery the next. Good stuff and ideas, SeaBass! Lead on! Last edited by Bonz; 11-04-2017 at 07:21 PM.